Okay, so the snow in my backyard doesn’t look like this. We have had chilly weather and flurries for a week now, led off by a rainy freeze that has left the streets icy and walking the neighborhood a slippery adventure. Thanksgiving morning we awoke to real snow and went sledding, which is a pretty great way to start the day. Puts me in mind of my midwest childhood. My last snow experience though, was a 5-day August trip in the Cascades mountains. With the kids safely at the grandparents, my husband and I headed off on a high traverse we’ve been wanting to do for years. We had an amazing weather window, and an incredible backcountry experience. Daunting that the glaciers are smaller, though – I feel so lucky to live near them and be able to get out into the mountains. 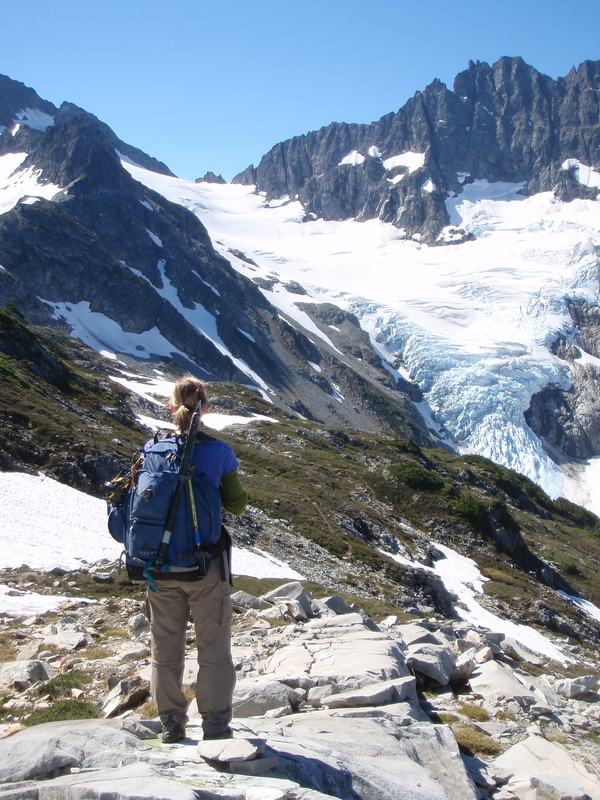 We traveled light, but with the glacier travel gear (ice axes, crampons, harnesses & rope), and wandered among the mountain goats, camping near alpine lakes.